Nemorexant (developmental code name ACT-541468) is a dual orexin receptor antagonist (DORA) which was originated by Actelion Pharmaceuticals and is under development by Idorsia Pharmaceuticals for the treatment of insomnia. It acts as a selective dual antagonist of the orexin receptors OX1 and OX2. As of June 2018, nemorexant is in phase III clinical trials for the treatment of insomnia. Idorsia is developing nemorexant, a dual orexin receptor antagonist (DORA), for the oral treatment of insomnia and investigating the program for the treatment of COPD. In May 2018, a phase III study was initiated in subjects with insomnia disorder and in September 2018, a phase I trial was initiated in COPD. 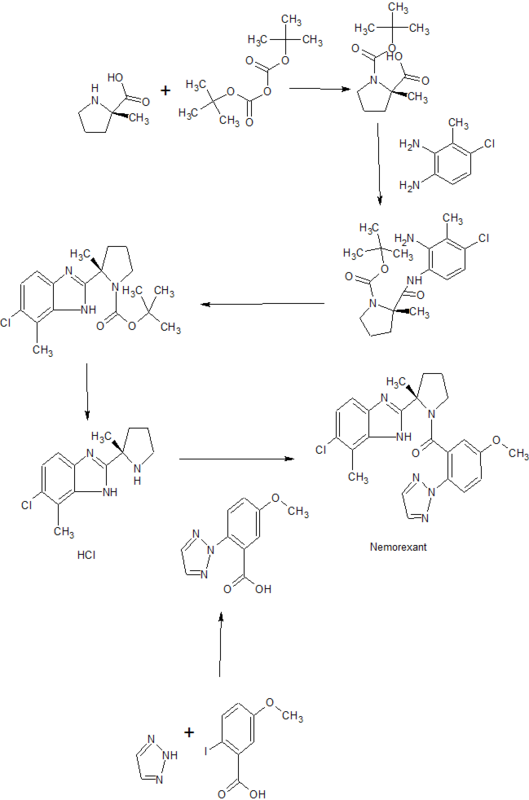 Which upon condensation with 4-chloro-3-methylbenzene-1,2-diamine using HATU and DIEA in CH2Cl2 affords the corresponding amide. Whose Boc moiety is removed by means of HCl in dioxane to yield 5-chloro-4-methyl-2-[2(S)-methylpyrrolidin-2-yl]benzimidazole hydrochloride. 2-Methyl-L-proline hydrochloride (99.7 g; 602 mmol) is dissolved in a 1/1-mixture of MeCN and water (800 ml) and triethylamine (254 ml; 1810 mmol) is added. The temperature of the reaction mixture slightly rises. The reaction mixture is cooled to 10°C to 15°C followed by careful addition of a solution of Boc20 (145 g; 662 mmol) in MeCN (200 ml) over 10 minutes. Stirring at RT is continued for 2 hours. The MeCN is evaporated under reduced pressure and aq. NaOH solution (2M; 250 ml) is added to the residual aq. part of the reaction mixture. The water layer is washed with Et20 (2x 300 ml) then cooled to 0°C followed by slow and careful addition of aq. HCI (25%) to adjust the pH to 2. During this procedure a suspension forms. 10 mg COMPOUND is mixed with 0.2 mL 0.1 M aq. HCI and 0.8 mL EtOH. The solvent is fully evaporated and 0.05 mL isopropanol is added. Alternatively 0.05 mL methyl-isobutylketone can be added. The sample is stored closed at room temperature for 4 days and crystalline material of COMPOUND hydrochloride in crystalline Form 1 is obtained. This material can be used as seeding material for further crystallization of COMPOUND hydrochloride in crystalline Form 1. Process for the preparation of a crystalline potassium salt of a 2-(2H-[1,2,3]triazol-2-yl)-benzoic acid derivatives is claimed. Compound is disclosed to be useful for the preparation of pharmaceuticals, especially certain orexin receptor antagonists such as nemorexant . ^ Jump up to:a b Equihua-Benítez AC, Guzmán-Vásquez K, Drucker-Colín R (July 2017). “Understanding sleep-wake mechanisms and drug discovery”. Expert Opin Drug Discov. 12 (7): 643–657. doi:10.1080/17460441.2017.1329818. PMID 28511597. Muehlan, C.; Heuberger, J.; Juif, P.E. ; Croft, M.; van Gerven, J.; Dingemanse, J.
Boof, M.-.L. ; Ufer, M.; Halabi, A.; Dingemanse, J.
Muehlan, C.; Brooks, S.; Zuiker, R.; van Gerven, J.; Dingemanse, J.